On February 21, Mr. Guo Wenqing, President of China Minmetals Corporation, Party Group Deputy Secretary, and Chairman of the Metallurgical Corporation of China Ltd. (MCC Group) led a delegation to visited Shenzhen, and paid a courtesy visit to Mr. Wang Weizhong, Deputy Secretary of Guangdong Provincial Committee and Secretary of Shenzhen Municipal Committee. On behalf of China Minmetals Group, Mr. Guo expressed this gratitude to the Shenzhen Municipal Party Committee and Municipal Government for their long-standing support and trust. Guo introduced the development since the strategic recombination of the former China Minmetals and the MCC Group, two of the Fortune Global 500, which has created a strong momentum for this largest metal mining company in China with the business portfolio first covering the whole industrial chain, from resource acquisition to exploration, design, construction, mining, mineral processing, smelting, logistics and trade. Under the guidance of the "quadrupling in three steps" development strategy, China Minmetals delivered the best business performance of operating income and profit in 2018. Currently, China Minmetals is building a "four beams and eight columns" business system oriented to metal mining, metallurgical construction, trade logistics and financial real estate. In addition, with 37 national scientific and technological innovation platforms and key laboratories, China Minmetals is a well-deserved leader in technology and innovation in central government-owned enterprises. Guo stressed that it has been a long and good history of cooperation between China Minmetals and Shenzhen. In the early stage of China's reform and opening-up, MCC, as one of the first construction enterprises and design units designated by the State Council, went down to the south of China, making significant contribution for the construction and development of the Shenzhen Special Administrative Region. The WISDRI Design Institute had completed the first edition of Shenzhen urban design plan. The China First Metallurgical Construction Group Co., Ltd had successively constructed the first overpass, the first avenue, the first sewage treatment plant and the first high-rise building for Shenzhen which were all the first projects at that time in China, and created the amazing Shenzhen speed of building one floor in five days during the construction of the Shenzhen International Business Building. Over the past decades, China Minmetals and its affiliated companies have taken root in Shenzhen to serve and construct a number of large-scale brand projects for Shenzhen, witnessing the earth-shaking changes of the city since China's reform and opening-up. Guo expressed the appreciation for the pioneer working spirit of the Shenzhen people and the wholehearted service spirit of the Shenzhen Municipal Party Committee and Municipal Government as a leader in China's reform and opening-up and modernization drive. As one of the central state-owned enterprises with the longest history and the deepest foundation in Guangdong Province, China Minmetals has accumulated rich experience in urban development and construction with world-leading technology and strong strength. At this momentous period of historical opportunity of the Guangdong-Hong Kong-Macau Greater Bay Area, China Minmetals will further expand its all-round government-business cooperation with Shenzhen in various fields, including the municipal infrastructure projects, the ecological and environmental protection, and the trade in the metal mining industry, the investment and financing, and the scientific and technological innovation, to jointly achieve Shenzhen's great dream of "becoming a core engine of Guangdong-Hong Kong-Macau Greater Bay Area" and to make greater contributions to the economic construction and people's happiness in Shenzhen. 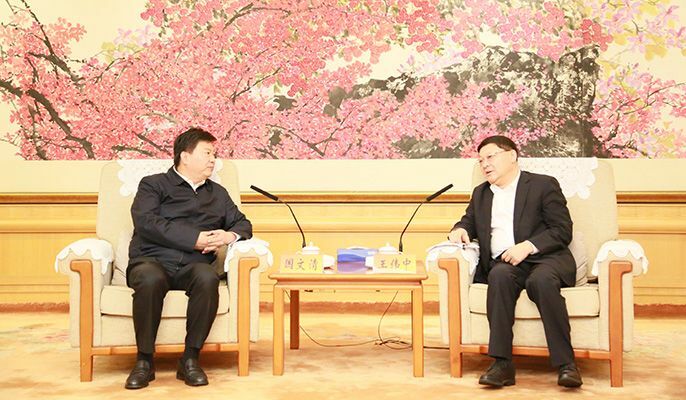 Mr. Wang extended a warm welcome to President Guo Wenqing and his delegation, and expressed his recognition and appreciation for the development achievements made by China Minmetals in recent years. 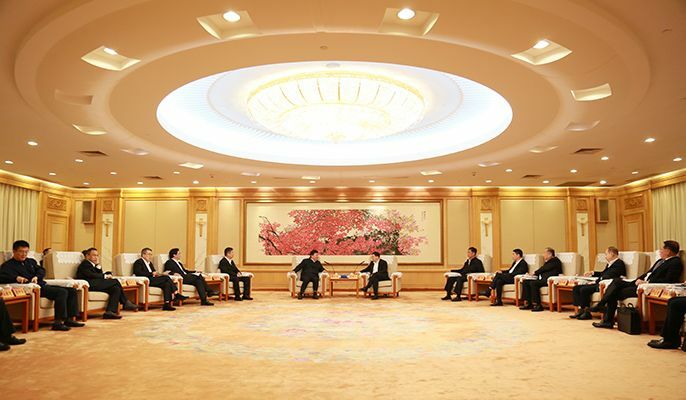 He said that the Guangdong-Hong Kong-Macao Greater Bay Area is a national strategy planned, deployed and promoted by General Secretary Xi Jinping, which is the important platform of action for the reform and opening-up of Guangdong and Shenzhen in the new era. As the national reforming pioneer, Shenzhen has undertaken the glorious mission of exploring for the nation's prosperity and rejuvenation, for the happiness of people in the socialist modernization drive. Therefore, the Shenzhen Municipal Party Committee and Municipal Government will resist the pressure, provide incentives, move forward at full speed, and make concrete moves, to promote the construction of Guangdong-Hong Kong-Macau Greater Bay Area. Wang pointed out that the better the central state-owned enterprises are developed in Shenzhen, the more benefits Shenzhen will get. As a key central state-owned enterprise with a long and good cooperation with Shenzhen, China Minmetals has made remarkable contributions to the economic and social development of Shenzhen with great achievements in the regional development and construction. The strategic cooperation with China Minmetals is not only to the benefit of the enterprise, but also conducive to the win-win situation for the government and enterprise in line with the Shenzhen's industrial development plan. Therefore, when China Minmetals has any difficulties and needs in Shenzhen, the Shenzhen Municipal Committee and Government will provide full support and help resolve the problems. In addition, China Minmetals is expected to actively participate in the Shenzhen's reform and opening-up, to play an important role in Shenzhen's missions in the new era and refreshing reform. Mr. Yang Hong, Member of the Standing Committee of the CPC Shenzhen Municipal Committee and Member of the Party Leadership Group of the Shenzhen Municipal People's Government, Gao Zimin, Member of the Standing Committee and Secretary General of the CPC Shenzhen Municipal Committee, and Ren Zhufeng from China Minmetals were also present at the meeting. Other attendees were Wang Youpeng, Director of Shenzhen Municipal Urban Planning, Land and Resources Commission, Zhang Xuefan, Director of Shenzhen Municipal Housing and Construction Bureau, Yu Baoming, Director of Transport Commission of Shenzhen Municipality, Guo Yuehua, Deputy Director of Development and Reform Commission of Shenzhen Municipality, Xin Jie, President of Shenzhen Metro Group, Li Wenxiong, General Manager of Shenzhen SEZ Construction and Development Group Co., Ltd., as well as the relevant personnel from the directly affiliated enterprises of China Minmetals including Zhang Mengxing, Wang Shilei, Liu Fuming, Li Zhongze, Wang Zhenzhi, Song Zhanjiang, Pan Biyi, Zhu Yonggui, Bai Xiaohu, Ning Heqiu, Leng Tiesong. Guo Wenqing is talking with Wang Weizhong cordially.